You will need a round tin 20 – 24cm diameter, with loose bottom. Grease the tin with butter. Crush the ginger biscuits (in a food processor or in a paper bag with a rolling pin). Combine the butter and biscuits together and gently press into base of tin. If you can, leave this for 2 hours (even overnight) in the fridge before making filling and baking, this is preferable. Whisk the eggs, add the sugar and flour – whisk. 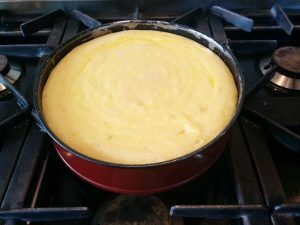 Add the mascapone, creme fraiche, 300 g of the 350g of mango puree and lime juice. Thoroughly mix. Stir in the remaining mango puree (to give a ripple affect) and the diced mango. Pour into tin and place in centre of oven. (You may want to place this on a baking sheet as the base may leek a bit). After 15 minutes turn the oven down to gas 3 / 140C fan / 160C and bake for a further 50 minutes or until the cheesecake wobbles very slightly when gently shaken. You could use apricot and orange instead of mango and lime.